The European Union, the Chinese government and many US states and cities have reiterated their commitment to the Paris climate change agreement, after the US government walked out of it. China and Europe “demonstrated solidarity with future generations”, European council president Donald Tusk said on 2 June, just after US president Donald Trump announced that Washington was quitting the deal. And on 7 June California governor Jerry Brown met with Chinese president Xi Jingping to talk about climate policy. The chorus disapproving Trump’s damaging gesture was impressive. But it should not obscure the fact that the international climate negotiations process, started in 1992 at the Rio “earth summit”, has been a monumental failure. 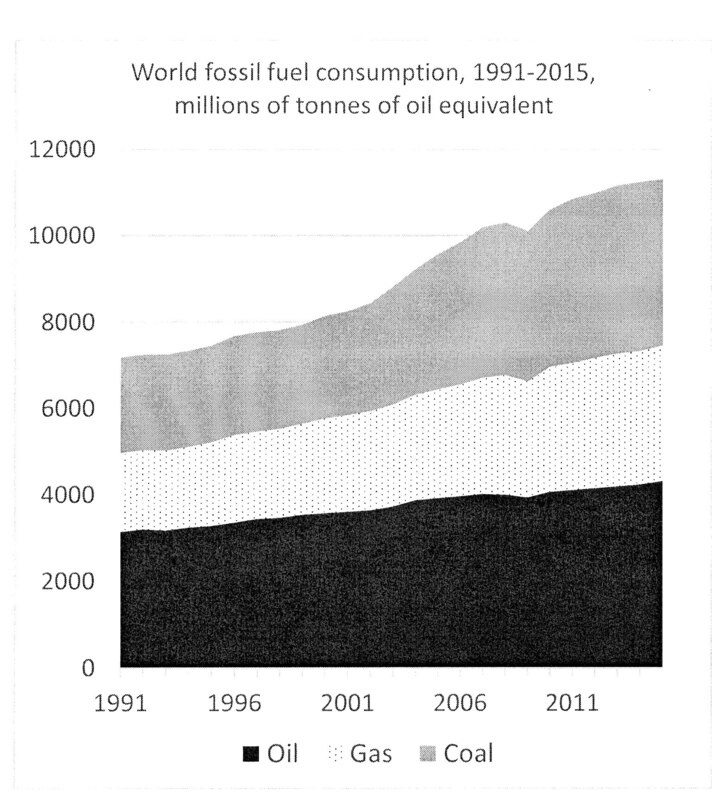 In the quarter of a century since Rio, the amount of oil, gas and coal burned globally each year has risen at an accelerated rate. The total is up by more than half (see graphic). The only pause was in 2009, due to the economic crisis, after which fossil fuel consumption growth resumed. These are the numbers that count, since fossil fuel consumption is the main source of greenhouse gas emissions that produce global warming. The 1992 treaty recognised the need to avert the danger of global warming, in the first place by reducing greenhouse gas emissions. But at Washington’s insistence, the Rio deal included no binding targets for reducing emissions. From the start the talks initiated at Rio were a battleground between (1) most rich-world governments and the US Democratic Party (who accepted the need to act on global warming), (2) the US Republican party and oil-producing countries (who denied climate science, long before anyone had even heard of Trump), and (3) developing-country governments, who feared that, having caused the problem, rich countries would try to avoid paying for it. In 1997, at the EU’s urging, the Kyoto protocol was signed. Participating countries committed to emissions reduction targets. The US Senate voted by 95 to 0 not to participate. It was the heyday of neoliberalism, and market mechanisms, such as the European Emissions Trading System, were to be used to achieve the targets. Forms of regulation (e.g. fuel efficiency targets for cars, building standards, and so on) were left strictly to individual governments. Instead of cutting greenhouse gas emissions, rich countries bought the “right to pollute” from elsewhere, and/or massaged their figures. The effect of the export of energy-intensive manufacturing processes to developing countries helped. The emissions trading scheme was a dismal failure even on its own terms. Emissions kept rising. In 2009, negotiators met at Copenhagen to agree on a successor agreement to Kyoto – and failed. The principle of binding targets was junked, while political leaders continued to talk as Tusk did about “solidarity with future generations”. The Paris deal, signed in 2015, recognised that global warming needs to be limited to 2degC above pre-industrial levels, but also that a 1.5degC target would be preferable. But the emissions reduction commitments made by participating countries, including the US and China, will miss those targets by miles. And the commitments are entirely voluntary – which is why many Republican politicians urged Trump to stay in the agreement. Climate scientists have calculated that if all the Paris pledges are kept, global temperatures will rise to 2.7degC above pre-industrial levels. The UN and other international bodies, and the signatory governments to the Paris deal, continue to pretend that market mechanisms are the answer. Twenty-five years of experience has shown that that is not the case. The Rio process has not only failed to produce results, but has limited the discourse around climate change to these neoliberal approaches. Some progress has been made e.g. in developing renewable energy for power generation, but claims that the transition away from fossil fuels is well underway are fanciful. Social movements and labour movements need to work out strategies for confronting the global warming danger outside of the Rio process. Organisations such as Trade Unions for Energy Democracy, and unions such as PCS (which has just produced a major report on the issue), are making important contributions to the debate about how. ■ Simon Pirani’s book on the global history of fossil fuel consumption since 1950 will be published next year by Pluto Press.